On my To Do list of stampin' projects is to make some plain notecards. 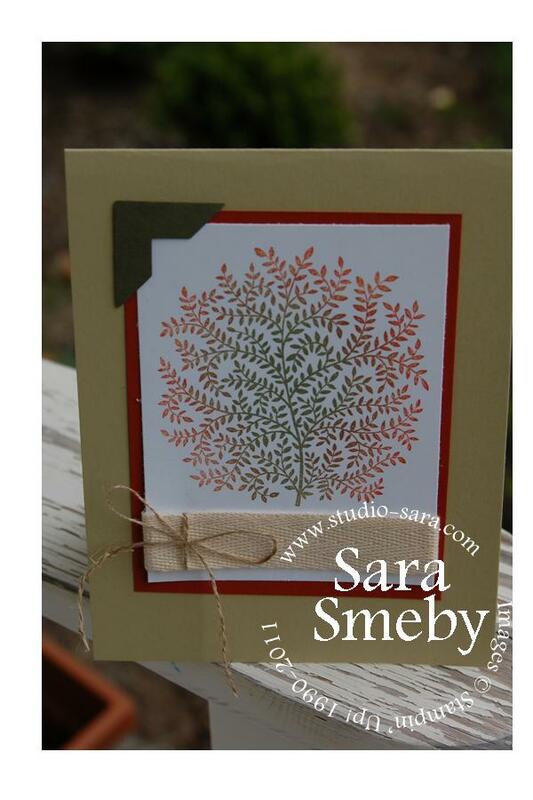 I like to take a simple design, make a ton and then have the flexibility to stamp a sentiment as the need arises. For example, I might use this card for a masculine birthday, as a Thank You note, for any autumn birthdays (man or woman), as a "Get well!" card or naked, as it is now, as a simple notecard. The inking is the trickiest part and it's not too bad. I used my Stampin' Sponges, cut into fourths for more ease of use (and to stretch that dollar!). I first inked the sponge in So Saffron and applied it to the outside of the tree. Next, I inked a different sponge with Always Artichoke and sponged the innermost part of the tree. Finally, I inked a third sponge with Cajun Craze and sponged the space between the So Saffron and Always Artichoke. Sponging is a pretty safe bet when you're blending colors like this, because it's not likely that you'll ruin your ink pads by pouncing on one color with something else. That said, I always use separate sponges for each color (and keep that sponge dedicated to that color, be it "Always Artichoke" or "Dark Green" -- either works). I also always start with my lightest color and then gradually work to the darkest. This is a principle I use when I watercolor, too. Finally, to make multiple cards, I simply swipe the stamp's surface with a baby wipe. I'll save my Stampin' Scrub for a final cleaning, but I don't want the stamp to get too wet between spongings. It's somewhat time-consuming, but considering it's the only stamping I'm doing right now for this project, I feel it is manageable. Plus, there's nothing like an assembly line to streamline the process when I'm making a larger quantity of the same card. Finally, I added a strip of Twill Tape and tied a bow of Linen Thread around it. I also punched the small corner using the Photo Corner punch and a scrap of Always Artichoke. Simple and versatile! Now I don't need to sweat it when the need arises for a handmade card! Thank you for your visit! I hope you found this useful! Very pretty Sara! AND thanks for the tip on how to sponge that image. Really like how you wrapped the linen around the twill tape. Beautiful image and I like your simple embellishments. they add charm without taking away from the image.